Although at first, I was sceptical whether I should do a guiding, I realised that I have done them all the time. On several occasions, I took friends with me on fishing trips and taught them the basics of fly fishing (See: Andy, Jan, Robin). This was always a lot of fun. 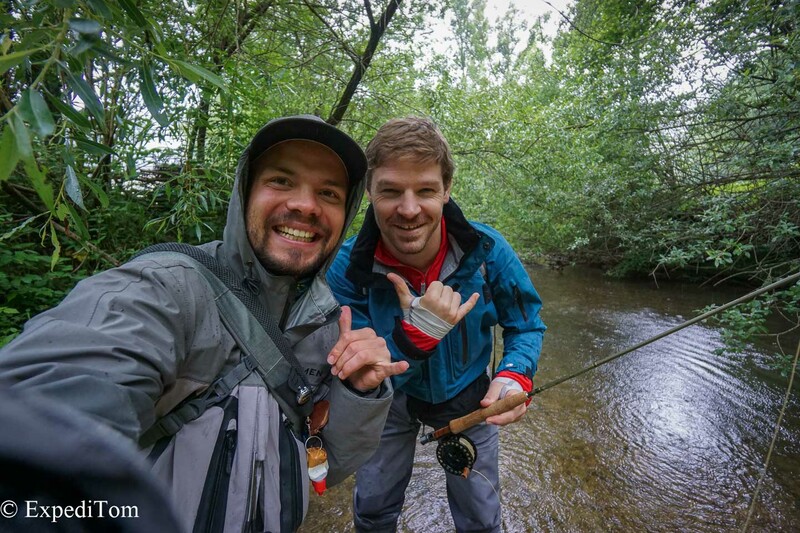 Therefore I agreed to do the fly fishing guiding in Switzerland with Attie. The closer the guiding day came, the worse the forecast was. 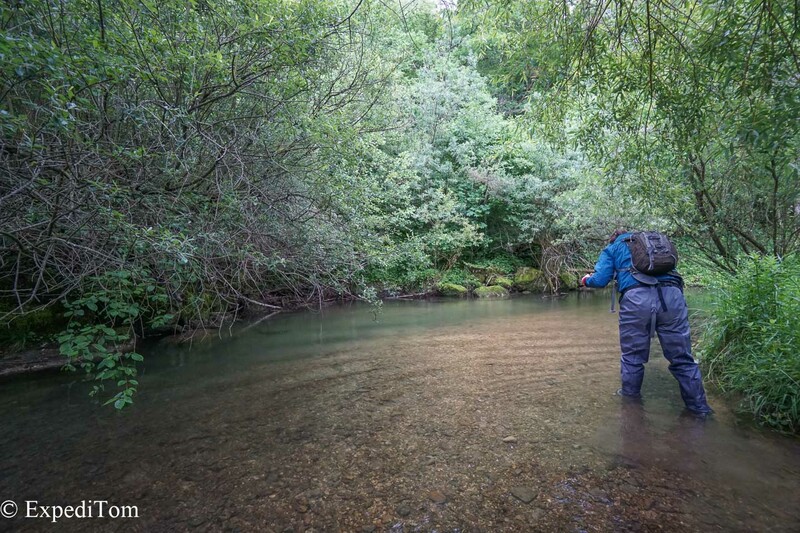 Therefore, I personally checked the water levels of the small creeks on the evening before the guided trip. Although most water levels of the larger rivers can be checked online, not all creeks undergo this electronic observation. 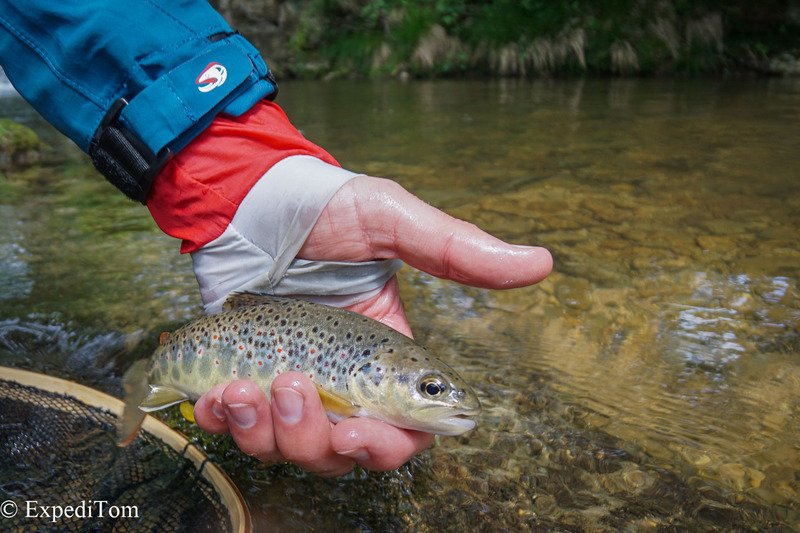 My own results were not promising for 2 creeks, but others were low enough for fly fishing. Moreover, the rain should stop during the night. Hence, I wrote Attie that the weather allows fishing. Attie and I met for our guided fly fishing in Switzerland at the train station. He is in his 30s and of athletic stature. The friendly looking character with dark eyes and bright brown hair visited Switzerland because he studies medicine and joined a meeting in Zurich. 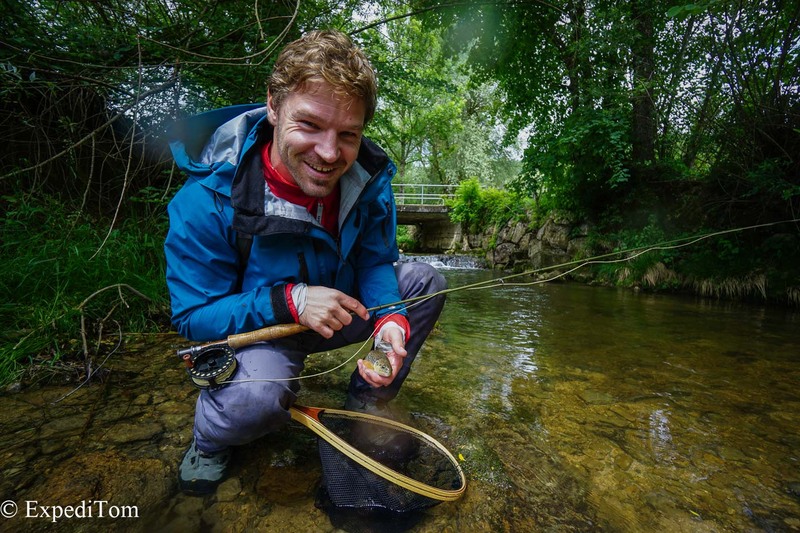 His hobbies are surfing, photography and he has recently started with fly fishing. I packed his bags into the car and off we drove to the river with a quick stop at a gas station for coffee and other necessities. Half an hour later and some interesting talks about our countries, we found ourselves in the backcountry of Switzerland. 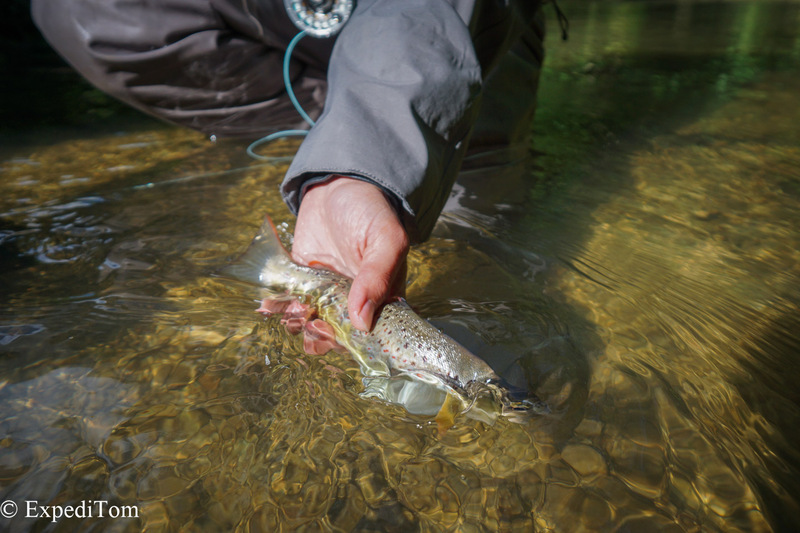 We geared up with Taimen waders and jackets and tied on a 9 foot 5x leader, which we lengthened with 3 feet 6x tippet. While leaving the car, Attie mentioned that just putting your car somewhere next to the road unattended is not common in South Africa. You rather pay someone to look after your four wheels. For me, it was the most natural thing in the world. 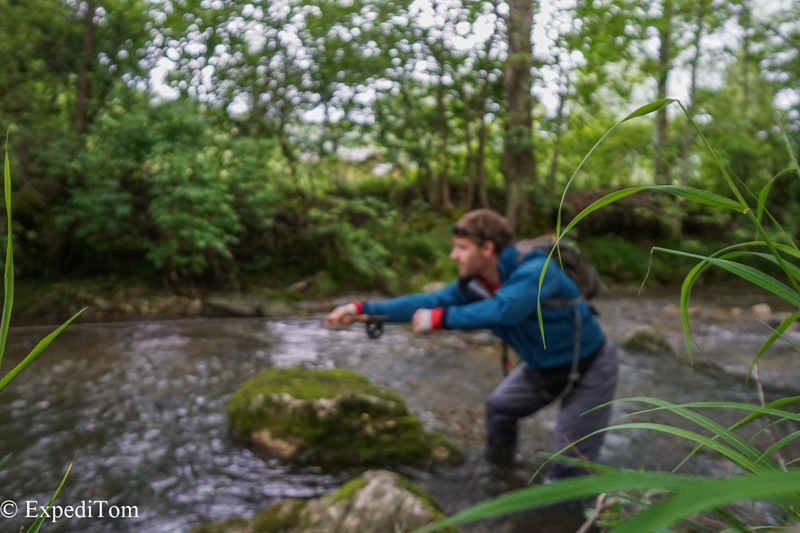 The creek we visited in the Jura mountains is rather small and at various places overgrown. Yet, it is at these places that the water holds its secrets. I tied on a #14 Royal Wulf in tandem with a small gold bead nymph. Advising him how to approach the first cascade, I showed Attie how I read the water and where I expect fish to hide. Given the tightness of the casting space, I taught Attie the roll cast, the bow and arrow as well as another “cast” to put the fly where it needed to be. The latter being not really a cast but rather a move while holding the fly in your hand. Even tough Attie’s casts were accurate enough, there was no bite. It was an overcast day with a few drops of rain, but soon the weather cleared up. Fishing two more pools with these method, we decided to change to an indicator nymph rig in order to get down deep. It was at the deeper bridge pool, that Attie managed to hook and land his first fish. Although no gigantic fish by any means, both of us were really happy about the catch. First catch of the day on a gold bead nymph in faster water. Visibly happy: Attie with his first small trout. Releasing the small trout back to its habitat. Attie and I observed the happening for a while and spotted several fish. Attie put himself in position and on the second cast the overwinged royal Wulff disappeared in a huge splash. At the same time, Attie lifted the rod pretty hard and the fly line hurled straight at us – without the Royal Wulff. As it was already afternoon, we once again changed our place to the Long Pool. Admittedly, even tough the name suggest a large pool it is rather narrow with a lot of branches attracting flies. However, if one manages to get a decent drift from the top of the pool, sometimes astonishing large fish await you. Yet, Attie did not get the fly there with the roll cast he had just learned earlier this day. Therefore, he asked me after a few tries to fish the pool. Usually, I do not fish when clients are present but when asked explicitly to do so, I agree. Believe it or not, I managed to land the dry slightly further than Attie and a trout smashed it. A few jumps later, I landed this beauty. Visibly impressed, Attie complimented his guide who was almost as surprised as he was. On the way back, we talked about the guiding. Attie asked me why I do not offer it publicly on my website because he really enjoyed it. It was exactly what he was looking for when visiting Switzerland. 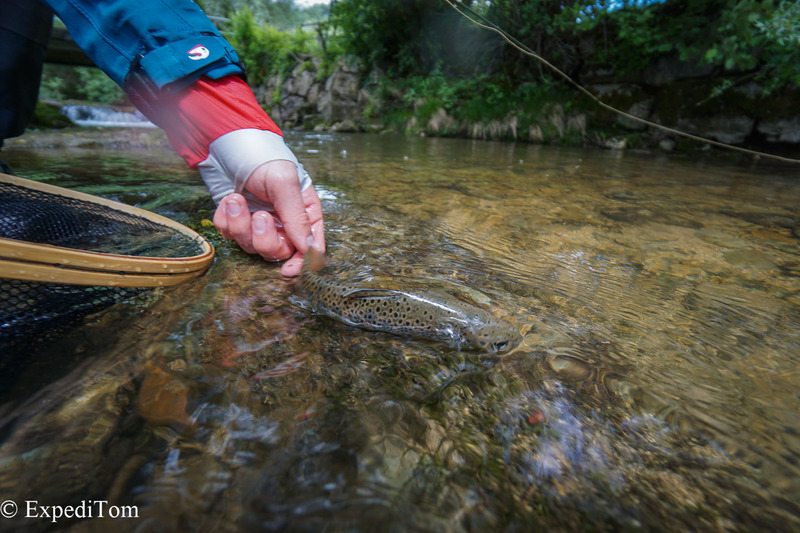 Getting him to the lesser-known corners of Switzerland and casting dries to eager fish in pristine nature. Although they were small, it did not decrease the pleasure of the experience. Furthermore, he liked having a guide with an affinity for photography who can speak English well. 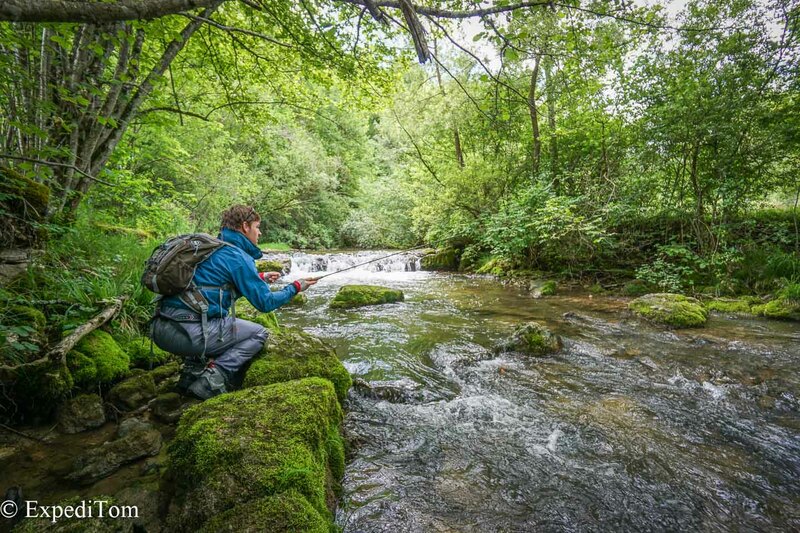 After these encouraging words, I decided to publish a page to get in touch with me for guided fly fishing in Switzerland. Thanks Attie for the laughs, it was a pleasure to spend the day with you! I”m reminded, by Logenhagen, that it took a Vernon Wells injury for Trout to come up. I”m not comparing Verdugo to Trout, but does the team want to leave it up to fate/chance? Or do they just want to evaluate Talent/readiness in a controlled environment.